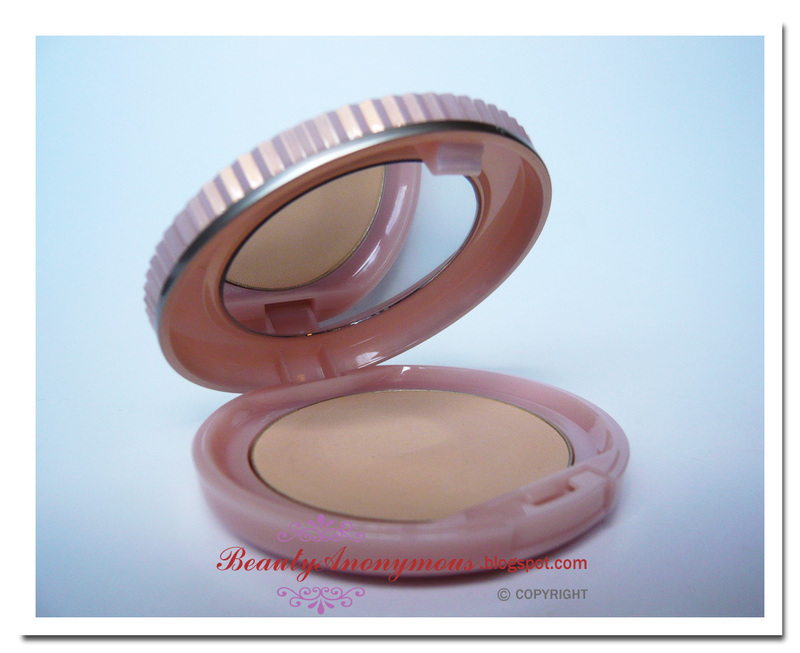 Lately, I have been using Paul & Joe's Creamy Powder Compact Foundation. I like how it brings out the radiant and clear skin, and as a bonus, it makes me look great in the pictures. I am more than happy to share my experience with this foundation that I have been using since the past winter. Creamy Powder Compact Foundation was released along with Moisturizing Foundation Primer from Paul & Joe fall 2008 base makeup collection. This foundation is cream-based, and is infused with the brand's signature Secret D’or, which is a champagne gold frost with "nine color gold shimmer" in various tones from white, pink, yellow, blue, green, silver, gold, red and purple. Each has subtle overtones and light reflective properties. The foundation has SPF15 with PA+. The shade I use, #10 Ivory, is the second lightest shade from the lineup. It is a light yellow ocher shade without pink undertones. In the fall and winter, 10 Ivory matches my fair skin well. However, this shade is one shade lighter to my face as I usually get slightly more tanned in the summer. The cream-based formula dries to a powder finish on the skin quickly. It feels silky smooth to the touch. It is such a pity that this foundation does not blend easily for my dry skin. 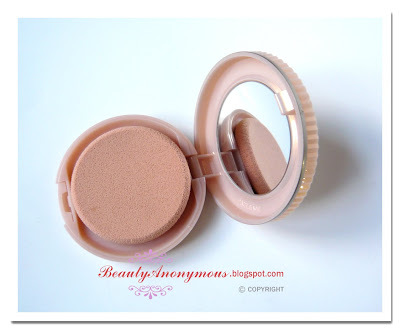 Compared to my other gel/cream-based foundations like Sonia Rykiel Water Gel Foundation, it requires more efforts to blend Paul & Joe's Creamy Powder Compact Foundation well to get an even complexion. It is rather time-consuming. The foundation glides on more smoothly with a foundation primer applied beforehand. Before applying Creamy Powder Compact Foundation, I use Paul & Joe's Moisturizing Foundation Primer (in #03 Creme), which certainly helps blend this foundation more easily and seamlessly. My skin type is normal to dry. Applying Creamy Powder Compact Foundation without a primer not only takes more time to blend to achieve a flawless appearance, also it tends to cake or clump up on the dry areas. This has nothing to do with its moisturizing ability. Personally, I think the foundation works better with well-moisturized skin to blend. The foundation doesn't dry out my skin. It actually leaves my skin feeling light, breathable and not greasy. It features Paul & Joe's signature orange flower scent. The scent is freshly floral and enjoyable. Creamy Powder Compact Foundation imparts a natural, sheer luminosity that leaves the skin glowing from within. It does not fully cover the redness and freckles. But it evens out the skin tone and makes the pores appear slightly smaller. Its oil control ability is fairly good during the cold weather. The foundation stays put, and does not turn dull or dark throughout the day. 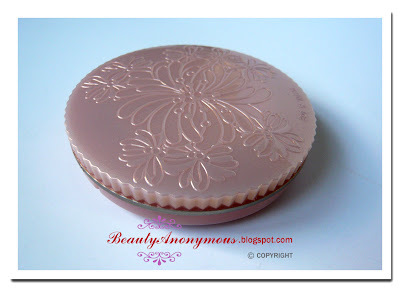 The soft pink case is adorned with Paul & Joe's signature chrysanthemum pattern, and comes with a mirror and a sponge. The sponge is designed to be placed right on top of the foundation. I prefer the sponge to be stored in a separate pan, however. Creamy Powder Compact Foundation SPF15 PA+ works better with well-moisturized skin to blend. If you have normal to dry skin, make sure to moisturize the skin well with a primer to set the skin for a smooth application of this foundation. When the foundation is blended well, it leaves the skin looking fresh, radiant and luminous. Sounds like what I like exactly! Anything creamy and powdery great in a complexion product! Thank you for sharing!